A whole milk with a smooth horchata back note and a touch of cinnamon. I designed this to be milk forward and have a creamy milk mouth feel with horchata, not overly powered but strong enough for a great balance. The whole milk base flavor and mouthfeel. This helps support the cream fresh and horchata as a base, texture and a sweeter helps blend the two flavors. Helps smooth out the horchata. At 3% it's perfect for blending with the other ingredients. Stands out over the vanilla custard and CDS but doesn't over power the cream fresh and really feels like a creamy milk with horchata. 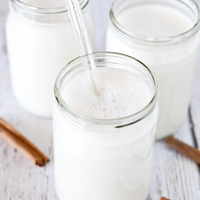 This is to just give the horchata a slight boost to make it a little more complex and the feel of a touch of cinnamon. I'm proud of this recipe and I hope you like it. This recipe is the property of Dalpho and released under the CC Attribution-NonCommercial-NoDerivatives 4.0 license. You may not copy, derive or commercialize this recipe without following the terms of this license or the explicit permission of the creator.